Law can be a difficult career path for non-law students who don't have experience within the legal field. Thankfully, Warwick Law Society hosts an array of events throughout the first term to assist students with applications. Warwick's Law Society is also perfectly positioned to provide careers advice and guidance to students from a law or non-law background. In 2018-19, Warwick Law Society will be establishing a Non-Law sub-committee consisting of students from various disciplines such as English Literature, Economics, Philosophy, Chemistry, and many more. By extending the reach of the Law Society, we hope to engage with students from a variety of disciplines and demonstrate that a career in Law is genuinely a possibility for everyone! Keep your eyes peeled on this page as well as the Careers Event page for any and all events that we host throughout the year!! 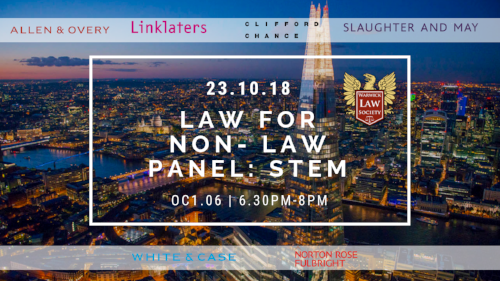 This year, the Non-Law team have been incredibly proud to have brought you two panel events: one for STEM students, and one for Humanities. Utilising the newly established Non-Law Sub-Committee, compiled of students from various disciplines including economics, maths, chemistry, sociology and more, we've been able to secure a very good attendance at both events. For the first time, the Law for Non-Law Panel was split into two evenings. With the STEM panel running first, it was fantastic to see so many students from scientific, technological, mathematical and engineering backgrounds in attendance. We were able to ask more specific and relevant questions to the panel, and the networking ran on for quite a while afterwards. 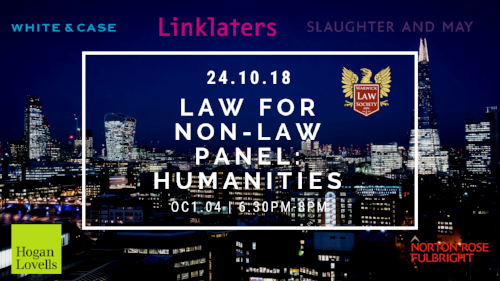 Thank you very much to Slaughter and May, Linklaters, and Clifford Chance for sponsoring the event!